NOW Whey Protein is a delicious blend of three of the highest quality whey protein concentrates and isolates from around the world: microfiltered; ion-exchanged; hydrolyzed (partially pre-digested). This blend of specially processed whey proteins is designed to maximize amino acid absorption and Biological Values (BV). Extra L-Glutamine has been added (550 mg per serving) because of its important role in protecting muscle tissue from breaking down under stressful, vigorous physical activity. Supplement Facts Serving Size: 1/2 Cup Amount Per Serving % Daily Value Calories 165 Calories from fat 15 Total Fat 1.5 g 2% Saturated fat 0.8 g 4% Sodium 330 mg 15% Total Carbohydrate 9 g 2% Sugars 9 g Protein 30 g 60% Calcium 90 mg 8% Potassium 128 mg 4% Stevia rebaudiana Extract (Leaf) 93 mg Suggested Use: Add 1/3 cup (28g)to 4 to 8 ounces of cold water, milk, or your favorite juice and blend. Also consider adding NOW Flax Seed Oil for enhanced nutritional benefit. Please note the additional calories and nutrients provided by the above ingredients. 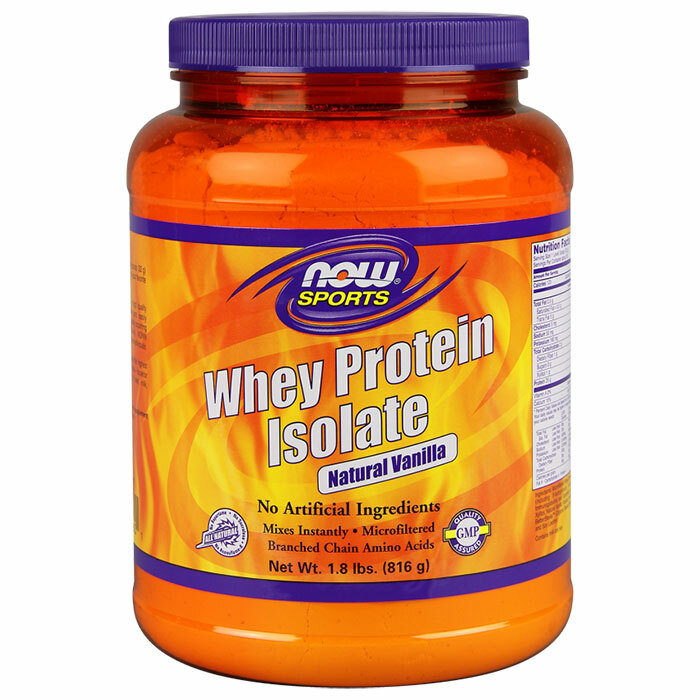 Other Ingredients: Whey Protein Blend (Micro-filtered Whey Protein Concentrate (providing B-lactoglobulin, a-lactalbumin,Immunoglobulins and Serum Albumin), Ion-exchanged Whey Protein Isolate (providing B-lactoglobulin, a-lactalbumin,Immunoglobulins and Glycomacro Peptides, Enzymatically Hydrolyzed Whey Protein Concentrate, Fructose, Natural Flavors, Free Form L-Glutamine and Xantham Gum. Warnings: Use this product as a food supplement only. Do not use for weight reduction. 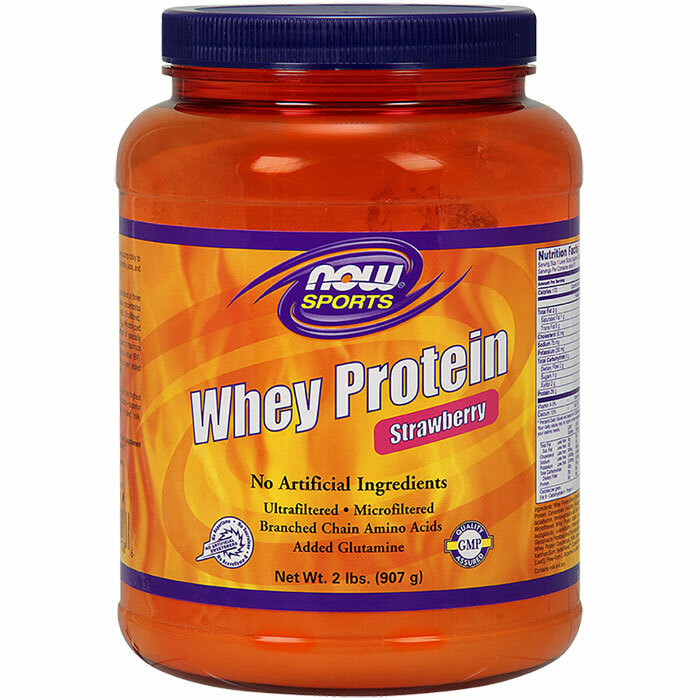 NOW® Whey Protein is a delicious blend of three of the highest quality whey protein concentrates, isolates and hydrolysates from around the world: Ultrafiltered, Cross-Flow Microfiltered and Enzymatically Hydrolyzed (partially predigested). 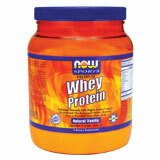 This blend of specially processed whey proteins is designed to maximize amino acid absorption and Biological Value (BV). Extra L-Glutamine has been added (380 mg per serving) because of its important role in protecting muscle tissue from breaking down under stressful, vigorous physical activity. What is Whey Protein and how is it processed? Whey is a natural byproduct from the cheese-making industry. It is the liquid that remains when the solids in milk are pressed together to form cheese. This liquid is then filtered and purified into a powder that is high in quality protein but free of fat and lactose (milk sugar). Because of the nature of whey, the purification process is a low-heat, spray-dry method that does not use any solvents. Quite simply, Whey Protein builds lean body mass by helping to increase your body’s production of muscle protein, which is especially important after intense workouts. Hence its classification as a sports supplement. It appears you have three different types of Whey Protein. What is the difference? NOW’s® three different types of Whey Protein are formulated to provide anyone, from the weekend warrior to the most serious athlete, with a "whey" that’s perfect for their fitness level. Our Economy formula is predominantly whey concentrate, which has a slightly different nutrient profile than the isolate form (detailed below) and provides about 16-17 grams of protein per serving. It’s ideal for the casual fitness enthusiast. Our premium quality blend contains a mixture of whey concentrates and whey isolates, with higher levels of whey isolate, and more protein per serving (20 grams). For anyone serious about their fitness this is a great choice. Our pure Whey Isolate yields more protein with less fat and carbohydrates than concentrates and is considered the highest quality whey protein currently available. 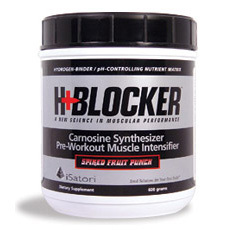 Whey Isolate has a high concentration of branched-chain amino acids (BCAA’s), which aid protein synthesis. It’s naturally low in carbohydrates and contains over 90% protein, compared to 80% for many concentrates and 6.25% for milk. Our Whey Isolates are instantized for easy mixing in milk or water. For athletes on high protein regimens and for those agressively seeking to build muscle NOW Whey Isolate is the way to go! Supplement Facts Serving Size: 1/2 cup (42g) Amount Per Serving % Daily Value Calories 155 Calories from Fat 15 Total Fat 1.5 g 2% Saturated Fat 1 g 5% Cholesterol 24 mg 8% Sodium 73 mg 3% Total Carbohydrate 9 g 3% Sugars 7 g Protein 26 g 50% Calcium 170 mg 15% Stevia rebaudiana Extract (Leaf) 97 mg Suggested Use: Add a 1/2 cup (42 g) to 8 oz. of cold water, milk, or your favorite juice and blend. Also consider adding NOW® Flax Seed Oil for enhanced nutritional benefit. Please note the additional calories and nutrients provided by the ingredients. Free of: salt, starch, yeast, wheat, gluten, corn, soy or preservatives. 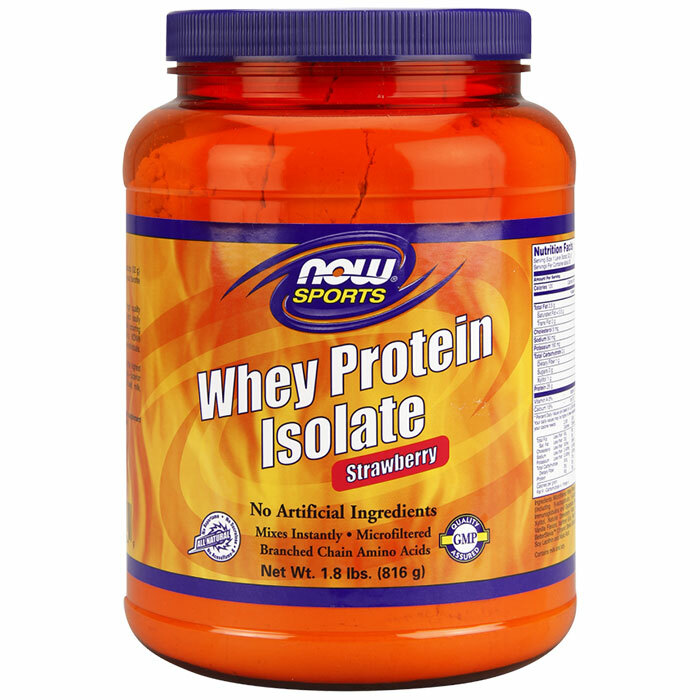 Other Ingredients: Whey Protein Blend [Ultrafiltered Whey Protein Concentrate (providing ß-lactoglobulin, a-lactalbumin, Immunoglobulins and Serum Albumin), Cross-Flow Microfiltered Whey Protein Isolate (providing ß-lactoglobulin, a-lactalbumin, Immunoglobulins and Glycomacro Peptides) and Enzymatically Hydrolyzed Whey Protein Concentrate], Fructose, Natural Flavors, Xanthan Gum, Free-Form L-Glutamine, Natural Color and Stevia rebaudiana Herbal Extract. Warnings: Use this product as a food supplement only. Do not use for weight reduction. Voted 2005 Whole Foods Magazine “Best Sports Supplement” Our 100% Pure Whey Isolate didn’t just raise the bar on what a protein should be, it shattered it! Each serving packs an impressive 50 grams of easily digested, cross-flow, microfiltered whey isolates and an incredible 14.5 grams of mass building BCAA’s. All this, with only 1 gram of fat and 7 carbs per serving. Don’t settle for inferior proteins that hide behind fancy labels and flashy full-page ads. If you demand excellence from your protein, you’re exactly who we designed our 100% Whey Isolate for. Supplement Facts Serving Size: 2 Level Scoops (62 g) Servings per container: 14 Amount Per Serving % Daily Value Calories 230 Calories from Fat 5 Total Fat 0.6 g < 1% Saturated Fat 0.4 g 2% Cholesterol 9 mg 3% Sodium 90 mg 4% Potassium 350 mg 10% Total Carbohydrate 7 g 2% Sugars 5 g Protein 50 g 100% Calcium 255 mg 25% Stevia rebaudiana Extract (Leaf) 75 mg Suggested Use: Add 2 level scoops (62 g) to 12-16 oz. of cold water, milk, or your favorite juice and blend. Also consider adding NOW® Flax Seed Oil for enhanced nutritional benefit. Please note the additional calories and nutrients provided by the ingredients. Free of: salt, starch, yeast, wheat, gluten, corn, or preservatives. Other Ingredients: Cross-Flow Microfiltered Whey Protein Isolate (providing ß-lactoglobulin, a-lactalbumin, Immunoglobulins and Glycomacro Peptides), Fructose, Natural Flavors, Xanthan Gum, Lecithin and Stevia rebaudiana Herbal Extract. Warnings: Use this product as a food supplement only. Do not use for weight reduction. What is Whey Protein and how is it processed? Whey is a natural byproduct from the cheese-making industry. It is the liquid that remains when the solids in milk are pressed together to form cheese. This liquid is then filtered and purified into a powder that is high in quality protein but free of fat and lactose (milk sugar). Because of the nature of whey, the purification process is a low-heat, spray-dry method that does not use any solvents. Quite simply, Whey Protein builds lean body mass by helping to increase your body’s production of muscle protein, which is especially important after intense workouts. Hence its classification as a sports supplement. It appears you have three different types of Whey Protein. What is the difference? NOW’s® three different types of Whey Protein are formulated to provide anyone, from the weekend warrior to the most serious athlete, with a "whey" that’s perfect for their fitness level. Our Economy formula is predominantly whey concentrate, which has a slightly different nutrient profile than the isolate form (detailed below) and provides about 16-17 grams of protein per serving. It’s ideal for the casual fitness enthusiast. Our premium quality blend contains a mixture of whey concentrates and whey isolates, with higher levels of whey isolate, and more protein per serving (20 grams). For anyone serious about their fitness this is a great choice. Our pure Whey Isolate yields more protein with less fat and carbohydrates than concentrates and is considered the highest quality whey protein currently available. 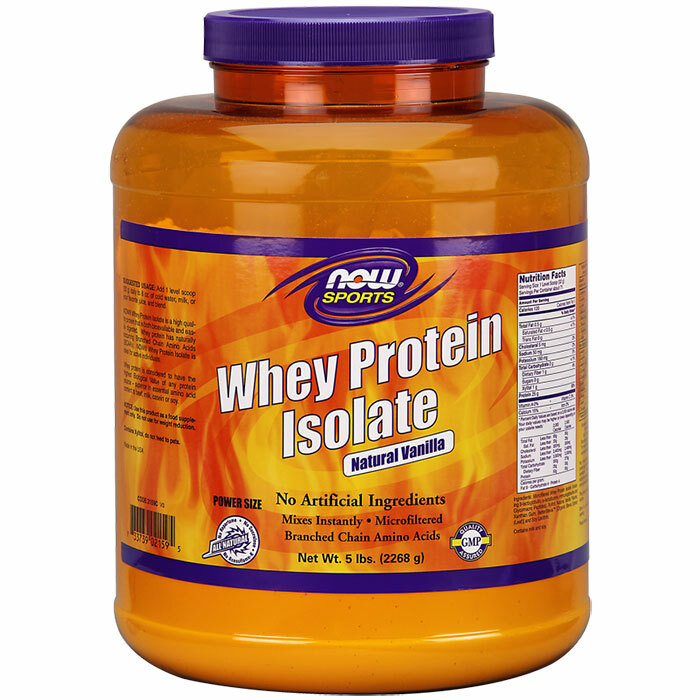 Whey Isolate has a high concentration of branched-chain amino acids (BCAA’s), which aid protein synthesis. It’s naturally low in carbohydrates and contains over 90% protein, compared to 80% for many concentrates and 6.25% for milk. Our Whey Isolates are instantized for easy mixing in milk or water. For athletes on high protein regimens and for those agressively seeking to build muscle NOW Whey Isolate is the way to go! Voted 2005 Whole Foods Magazine “Best Sports Supplement” Our 100% Pure Whey Isolate didn’t just raise the bar on what a protein should be, it shattered it! Each serving packs an impressive 50 grams of easily digested, cross-flow, microfiltered whey isolates and an incredible 14.5 grams of mass building BCAA’s. All this, with only 1 gram of fat and 7 carbs per serving. Don’t settle for inferior proteins that hide behind fancy labels and flashy full-page ads. If you demand excellence from your protein, you’re exactly who we designed our 100% Whey Isolate for. Supplement Facts Serving Size: 2 Level Scoops (62 g) Amount Per Serving % Daily Value Calories 240 Calories from Fat 10 Total Fat 1 g 2% Saturated Fat 0.6 g 3% Cholesterol 9 mg 3% Sodium 160 mg 6% Potassium 475 mg 15% Total Carbohydrate 7 g 2% Dietary Fiber 1.5 g 6% Sugars 4 g Protein 50 g 100% Calcium 270 mg 25% Stevia rebaudiana Extract (Leaf) 80 mg Suggested Use: Add 2 level scoops (62 g) to 12-16 oz. of cold water, milk, or your favorite juice and blend. Also consider adding NOW® Flax Seed Oil for enhanced nutritional benefit. Please note the additional calories and nutrients provided by the ingredients. Free of: salt, starch, yeast, wheat, gluten, corn, or preservatives. 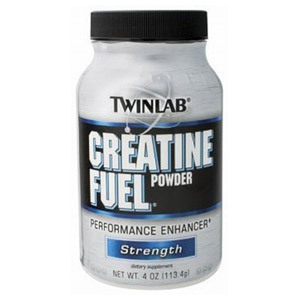 Other Ingredients: Cross-Flow Microfiltered Whey Protein Isolate (providing ß-lactoglobulin, a-lactalbumin, Immunoglobulins and Glycomacro Peptides), Fructose, Natural Flavors, Xanthan Gum, Sea Salt, Lecithin and Stevia rebaudiana Herbal Extract. What is Whey Protein and how is it processed? Whey is a natural byproduct from the cheese-making industry. It is the liquid that remains when the solids in milk are pressed together to form cheese. This liquid is then filtered and purified into a powder that is high in quality protein but free of fat and lactose (milk sugar). Because of the nature of whey, the purification process is a low-heat, spray-dry method that does not use any solvents. Quite simply, Whey Protein builds lean body mass by helping to increase your body’s production of muscle protein, which is especially important after intense workouts. Hence its classification as a sports supplement. It appears you have three different types of Whey Protein. What is the difference? NOW’s® three different types of Whey Protein are formulated to provide anyone, from the weekend warrior to the most serious athlete, with a "whey" that’s perfect for their fitness level. Our Economy formula is predominantly whey concentrate, which has a slightly different nutrient profile than the isolate form (detailed below) and provides about 16-17 grams of protein per serving. It’s ideal for the casual fitness enthusiast. Our premium quality blend contains a mixture of whey concentrates and whey isolates, with higher levels of whey isolate, and more protein per serving (20 grams). For anyone serious about their fitness this is a great choice. Our pure Whey Isolate yields more protein with less fat and carbohydrates than concentrates and is considered the highest quality whey protein currently available. 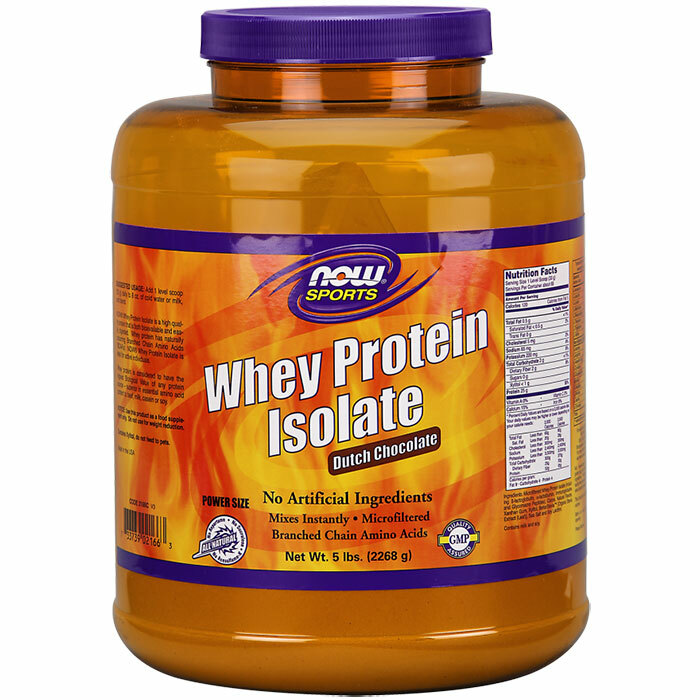 Whey Isolate has a high concentration of branched-chain amino acids (BCAA’s), which aid protein synthesis. It’s naturally low in carbohydrates and contains over 90% protein, compared to 80% for many concentrates and 6.25% for milk. Our Whey Isolates are instantized for easy mixing in milk or water. For athletes on high protein regimens and for those agressively seeking to build muscle NOW Whey Isolate is the way to go! You are currently browsing the archives for the Sports Nutrition category.